One in six workers in the UK are currently experiencing a common mental wellbeing problem such as anxiety and depression. Research by the charity Mind has not only highlighted that employees still find talking about their mental health difficult, but that many feel scared and confused about confronting their issues at work, with a culture of fear prevailing. Despite a growing number of employers taking positive steps towards creating an environment that encourages their colleagues to speak out, close to one-third (30%) of staff surveyed by the charity disagreed that they would feel comfortable talking with their line manager regarding stress. So what positive steps can you take to improve the wellbeing in your workplace? Eight hours a day staring blindly at a computer screen is hardly indicative of a healthy lifestyle. Not only is sitting for long periods terrible for your body, but inactivity and a lack of exercise is one of the main causes for low mental wellbeing. Encouraging colleagues to run, walk or ride a bike to work is just one of the ways you can positively affect their lives. Something as simple as receiving a weekly fruit delivery for staff can both boost productivity and champion healthy eating immediately. It doesn’t have to be as extreme has work yoga sessions, you can simply allow them ‘moving breaks’ where they can get up and have a quick walk around the office to re-focus. 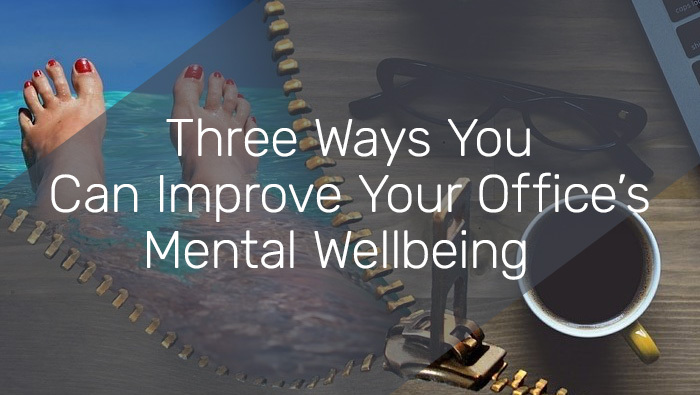 There are literally hundreds of creative ways to make your office fitter and stronger mentally for the challenges they face every day. Since January last year, French companies have been legally required to guarantee their employees a ‘right to disconnect’. Unlike our cross-channel cousins, the UK has no such law. Overuse of digital devices has been directly linked to burnout, stress and relationship issues in the workplace – with many employees unsure of when they can ‘switch off’. Much like the mobile phones we’re all constantly looking at, we need time to re-charge the batteries. When colleagues leave work, let them leave it behind and turn off the mobile and focus on themselves. You’ll find they come back more refreshed, productive and engaged with what they need to do. Enact your own ‘switch off’ policy, where employees don’t have to reply after 6pm in the evening to requests. Opening-up about a mental health issue can be one of the hardest things for someone to do, especially in an office environment. 85% of workers in the UK still feel there is a stigma attached to stress and mental health issues in the workplace. When someone comes in limping with an ankle cast on it is easy to see something’s wrong, but with mental health people often continue in silence. It can be as simple as asking someone how they really feel over a cup of tea or letting them visit their GP or counsellor no questions asked – everyone deals with it in their own way. Work is often the most stressful factor in our lives and creating an atmosphere where we are all free to discuss our wellbeing can be invaluable. Let your employees know from the off-set that your door is always open.